Located three miles south of Governor's Harbour on the Atlantic coast of Eleuthera, looking out onto one of the most beautiful beaches in the Bahamas. Relax in the warm waters of the Venus Pool, visible only at low tide. Walk for miles on the cool pink sand. Build fires from driftwood and cook under the stars. The houses are at the end of a long private driveway. 'Pebbles, the guest cottage, has it's own parking area, out of sight of the Main House. The houses enjoy complete independence, and do not over look each other in any way. Both On the Rocks and Pebbles have had new doors and windows installed March of 2016. Decorated in true Caribbean colours, nearly all the rooms look out to sea. Nearby are some of the best restaurants on the island. Tippy's famous beachfront restaurant is half a mile away down the beach. Mate and Jenny's has real island atmosphere. Sky Beach Club's excellent restaurant and pool bar is less than 10 minutes by car. Amenities: The Main House has four bedrooms with ensuite bathrooms. One kingsize bed, 2 queens and 2 single beds (twins can covert to king). The 'Children's Room' has 2 daybeds and shares a bathroom. The guest cottage, 'Pebbles', can be rented together with the main house (an additional charge applies to the main house rate) or separately. Pebbles has one kingsize bed, 2 full bathrooms and a sofa bed in the living/dining room. Both houses have fully equipped kitchens with microwaves, blenders, coffee machines, and dishwashers. Linens and towels are included. Washing machine (and a dryer in the main house). Telephone for local and incoming calls. DSL high speed wireless internet, Direct TV with many channels. IPod dock CD players, along with a good library of books, backgammon and other games also in the house. Beach umbrellas are also included. Both houses are air conditioned throughout (with the exception of the kitchen and TV room in the main house). Laundry lines hung discreetly behind some pandana bushes! A wonderful house for family fun or groups of friends who want to enjoy each others company yet retain their own space and privacy. Activities: Walking for miles on the beach. Swimming, snorkeling and fishing. There is a pool and tennis courts at Cigatoo Resorts just down the road. Bicycles are available for teen-agers and adults. There are several excellent restaurants within a 20 minute radius by car. The nearest is Tippy's, which is less than a mile down the beach, and a little further along is The Beach House. Both have live music on certain nights. Enjoy the casual atmosphere of the island! The town of Governor's Harbour, 2 miles from On the Rocks, has all necessary shops, banks, travel agent, grocery stores, gift shops and restaurants. It is picturesque and unspoiled. There are no large hotels or casinos on Eleuthera. It is a beautifully quiet and peaceful island. There are many beaches to explore! Harbour Island is an hour to the north and makes a great day trip. Lunch at the famous Pink Sands resort, scuba diving at Valentine's Dive Centre and renting a golf cart to ride around the island and enjoy the beautiful architecture of the old Bahamian houses dating back to the 18th century. 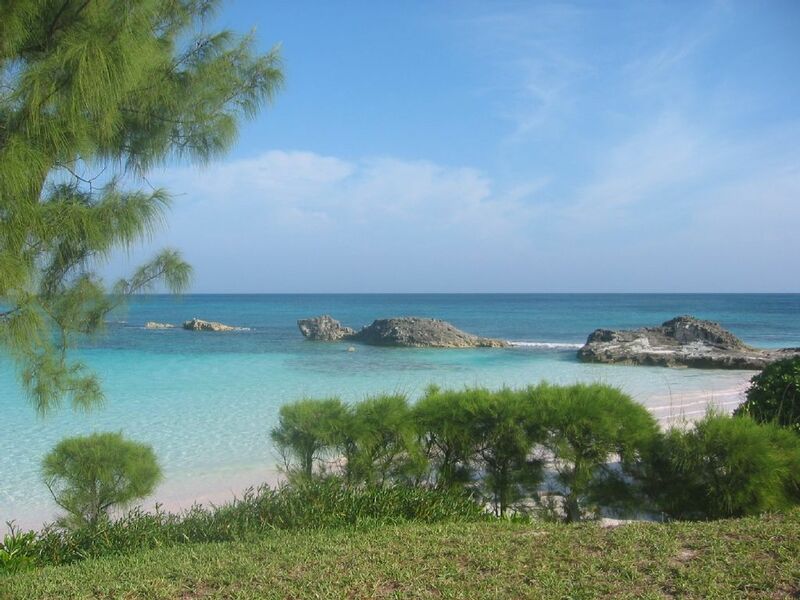 There is a dive centre down south, on Cape Eleuthera, as well s many beaches to explore! PEBBLES GUEST COTTAGE IS NOT INCLUDED IN THE ABOVE RATES. Pebbles rents for $1450/week and up depending on season. Can you get any closer to the beach? Stunning views out to sea and up the coast...not a dull moment with all that ocean to watch! All the bathrooms are tiled and 3 have both tubs and shower but the one with goes with the Orange Bedroom only has a shower. This one can be shared by the 'Children's Room. There is washing machine, and clothes are dried on the clothes line which is found is a secluded area of the garden. On the Rocks has it's own well, so the water is soft and clean. However, if you are concerned about drinking this water, bottled water can be purchased locally. We use the well water for everything, including drinking. As there are no farms, or factories which could cause impurities. But water has not been tested. The perfect vacation home for family and friends! We spent 2 wonderful weeks at On the Rocks. Our first week was with family , and our second with friends. The house is as welcoming as an old friend, decorated with the owner's colorful art and treasures from their travels. The rooms were totally accommodating. Having bathrooms for every one is really nice. The view from the living room is spectacular and the furniture is lovely. We had a puzzle in works on the coffee table, a table for watercoloring, and a dining table that comfortably seated all 8 of us. The daybed room proved irresistible to those who pretend to read but actually nap. The kitchen was perfect for us, a group of people who love to cook with plenty of cookware, dishes and glasses. We bought grouper, conch and snapper from the fishermen in the harbor, great bread and produce from Bacchus, wine from Bristol in Cupids cay and all else from the markets in town. We had delicious lunches and dinners at the Buccaneer Club and dinner at Tippy's and brought yummy takeout from Bacchus as well. The house is situated on an exquisite beach, with trees providing sufficient filtered sun that we didn't need an umbrella. The Venus pool does not disappoint. It is perfect for children as well as evening cocktails. And then there is the snorkeling! The reefs out past the rocks sport some of the most colorful coral and fish I have seen in years. Beulah, the housekeeper, takes good care of the house and it's guests. We have stayed in 3 different homes on Eleuthera. All were lovely, but everyone who stayed with us at On the Rocks has already decided this is the place for next summer. The location is wonderful. Easy access, private, beautiful views, easy beach access. The house on the other hand needs work. It had active termites in several rooms.Live termites, termite frass,and termite damage. Saw dust and termite frass would literally fall out of doors when closed. Louvered windows that don't close all the way, so heat and bugs seep right in. AC in the master bedroom wouldn't cool. I ended up sleeping in another room. There was no satellite TV as promised. Not even a box. Kitchen did not have AC (which was disclosed) but was never got cooler than 81 degrees. The house was somewhat dirty when we arrived. My wife spent the next morning cleaning. The housekeeper that was supposed to clean, never came. The pictures are very misleading. I have stayed at a lot of places in the Bahamas, so I have a good idea of what to expect. This was not up to par. Another wonderful stay at On the Rocks! We love the layout of the house! Plenty of bedrooms and bathrooms for a large family. The living area is huge with sliding doors to the most spectacular view of the ocean. Lots of games for the family to play. Many thanks to Misty, who took great care of the house and us! The house has a large kitchen and bar area with plenty of cooking utensils and dishes. We love the new grill. The location of this property cannot be beat, close to town and amenities. Yet it offers privacy and one of the most spectacular beaches we've seen. We snorkeled outside the rock formations several times. Perhaps some of the best snorkeling we have experienced in many years. We saw over 100 varieties of large and small bright and beautiful fish! Along with a huge school of giant parrot fish. If you like to spend most of your time on the beach and in the water. This is a great place! On the Rocks is a lovely house in a magical location! Perfectly situated on a beautiful rocky point that provides privacy and access to one of the top beaches on the Atlantic side. Pat and Robert have beautifully decorated the house and the layout is perfect for a larger group. We enjoyed preparing meals in the big, well-outfitted kitchen. Between surf and snorkel sessions, we enjoyed lounging on the front patio and lawn. The bedrooms are large and provide comfy beds. We really liked the way that each bedroom had it's own attached bath. This location on Eleuthera is very convenient to Governor's Harbour and Rock Sound. Either township is a quick drive on nice roads. We found some very good snorkeling and caving sites within a 10 minute drive. PROTIP: If the weather is ugly - go visit some cool caves! North Palmetto is a nice settlement. There are a few medical clinics and a few places to get really good Bahamian food. If you walk north on the beach, you can enjoy Tippy's after a nice 20-minute beach walk. If you are VERY LUCKY you might get to meet the owner's 3 cute beach dogs. They visited us twice daily and provided lovely tour guide service on a couple of beach hikes. We stayed at “On The Rocks,” in July of 2016. We were immediately impressed by the art and décor of the property. It has a very beachy, colourful, island feel. The property has the capacity for a large number of guests. It has a full kitchen and utility room. Although the location was quiet and remote the property still provides modern conveniences. Nearby there are two wonderful delis with fresh coffee, pastries and bread baked daily. We were a family of two teenagers and a four year old. My eldest daughter and I spent our time reading and working on our tan. We went swimming and enjoyed relaxation time on the sun trapped patio. There is a library of books and magazines. My son and his Dad played board games, also provided and went snorkeling. We even bought the four year old her own snorkeling set as there was such an array of ocean life to be discovered at the beach. The beach was second to none. It was like something from a movie, with pink sands and turquoise waters and more or less completely private. We spent hours enjoying the shallow waters. It is advisable to wake with the sun and take a sunrise walk at low tide. The views of the sunrise across the quiet ocean were majestic. The restaurants close by were fantastic and we would especially recommend Tippy’s where you will soak up local culture and atmosphere and also the 1648, a fabulous dining experience with great service and delicious fare. Another adventure that we would recommend would be a day trip to Harbor Island which can be accessed via ferry. Once there, rent a golf buggy, explore the great shops and restaurants and visit the Gallery for beautiful local paintings and photography. You won’t be disappointed. Our trip to Eleuthra and our stay at “On The Rocks” will remain in our hearts and memories for years to come. There are several great restaurants, some with live music on certain night...all within a 15 minute drive. The Beach House and Tippy's are only a mile of so down the beach! In the afternoon the fisherman sell their catch of fresh fish on the dock in both Governor's Harbour and Tarpum Bay! However, be careful to buy what is in season...Nassau Grouper is OUT OF SEASON from Dec.1-Mar.1. during their breeding period. Craw Fish are OUT OF SEASON Apr.1-Aug.1...same reason. PLEASE RESPECT THESE SEASONS even if you are offered the fish by unscrupulous fishermen...if we want to have fish for the future! The same in restaurants during this time...please ask what fish they are serving! For those who enjoy rougher waves...Surfer's Beach up north is wild and rugged...where as the LightHouse beach down south is romantic and secluded! Eleuthera is an island of wonderful places to explore and few people to bother you! MARCH 22-24 2013 the first ever ELEUTHERA ALL THAT JAZZ Festival in aid of the Haynes Library in Governor's Harbour! For more details, go to FB page Eleuthera All That Jazz! Rates are for up to 6 guests. Additional guests: $400/week per adult, $300 per child aged 2 to 12. Babies under 2 are free. NOTE: We have set the rates this way to make the property affordable for smaller groups who use less water and electricity, and create less wear and tear. PEBBLES GUEST COTTAGE IS NOT INCLUDED IN THE ABOVE RATES. Pebbles rents for $1450/week and up depending on season.